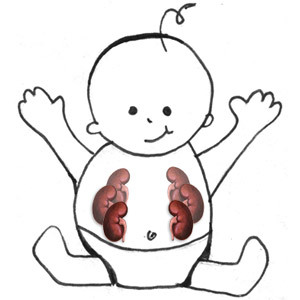 A friend’s doctor told her that babies have 6 kidneys. I thought that was the most ridiculous thing I’d ever heard, and as a product of the Information Age, I wasn’t about to take the doctor’s word for it. So I consulted the one place I know to be trustworthy. The Internet. Ok, ready to move on? This was a classic game of telephone. What the doctor actually said was probably to the effect of, “Fetuses develop three sets of kidneys.” That doesn’t mean they have six all at the same time – which is how my friend (or maybe just I) interpreted it. The kidneys develop in three stages. You can see an animation of it here. The fact is, even if I’d understood what the doctor was saying, I still wouldn’t have believed it. It’s pretty weird … and if you don’t think so, you didn’t watch the video … and if you still don’t think so, you’re probably just smarter than me.